Acquavella Galleries is pleased to present Dubuffet | Barceló, an exhibition of paintings by French postwar painter Jean Dubuffet and acclaimed Spanish artist Miquel Barceló, on view from June 30 to September 19, 2014. The exhibition will feature distinct bodies of work from each artist – several of Barceló’s recent white paintings and dark bleach portraits will be shown alongside a selection of Dubuffet’s landscapes and portraits. Since he was a teenager, Barceló has been drawn to Dubuffet’s poetic writings and unconventional aesthetic. In juxtaposing portraits and landscapes by both artists, this exhibition aims to highlight their thematic and material affinities. 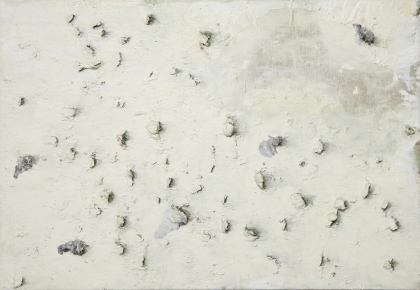 Dubuffet employed various techniques to represent soil in his series of Texturologies from the 1950s. Acting as an inventory of various types of terrain, these paintings celebrate the nuances of material. Dubuffet initially intended to create the series as an assemblage evocative of earth’s expanse that could be endlessly extended; however, his attachment to these initial paintings prevented him from producing this assemblage, and they remain as individual works. With their encrusted, tactile surfaces, Dubuffet’s Texturologies evoke the textures of the earth. This obsession with formlessness extends to Dubuffet’s portraits, several of which are included in this exhibition. His methods of rendering the human figure reflect his fascination with primitive and naive art practices. similarly personal. These paintings, made with bleach, chalk, and charcoal on dark canvas, present ethereal renderings of the artist’s colleagues and friends. 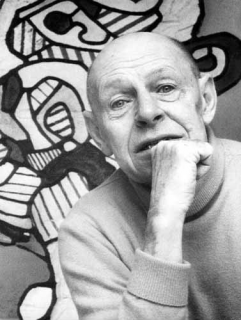 Jean Dubuffet (1901 – 1985) was born in Le Havre, France. In 1918 he moved to Paris to study at the Académie Julian, which he left after six months to study independently. After abandoning painting to work at his family’s wine business for several years, Dubuffet fully committed himself to being an artist in 1942. His fascination with Hans Prinzhorn's Artistry of the Mentally Ill deeply influenced his artistic practice, and led to his coining of the term “Art Brut.” For Dubuffet, the raw and uninhibited expression of Art Brut provided a fresh and alternative direction to what he saw as the stifling decorum and conformity of French culture and the Western tradition. Painting in a deliberately crude manner, Dubuffet developed a technique of thick impasto, called haute pâte, and frequently incorporated unorthodox materials ranging from cement and gravel to leaves, dust, and even butterfly wings into his works. His controversial materials and mark-making solidified his legacy as an iconoclastic figure in the canon of postwar European painting. His work has been exhibited in and collected by major public and private institutions across the world.